We’ve already observed how “cute” those little mice are in a previous post that also pointed out the health hazards of allowing a mouse infestation to fester.While mice are a lot more attractive than their larger rat cousins, they are no less vermin. They can eat through cables, leave droppings everywhere and, most importantly, carry disease, which they can transmit through their bite or their droppings. One white mouse in a cage as a pet is fine. A family of them scurrying through your house is not. Many of our clients on Cape Cod and along the Massachusetts south shore have already learned this lesson, and we’re happy to have been of service to them. Fortunately, even for those residents who let the problem linger a little bit too long, our superior methods of pest removal have been able to resolve the problem. Whatever the level your mouse problem in Cape Cod has reached, Pest Pros has the solution. Today, we want to discuss our approach in eliminating the problem and exterminating the varmints, with the aim of resolving your mouse infestation in Cape Cod once and for all. We tackle the mouse issue in two ways. Remember, just because you get rid of the mice doesn’t necessarily mean you get rid of the problem. The bacteria mice spread love to hide in the nooks and crannies and the insulation of your home, just waiting to float out and infect your family. Thus, our two-step approach involves getting rid of the mice and the hazards they pose. This isn’t your old rusty mousetrap. We employ a sophisticated, eco-friendly system that can cleanly catch all the mice in your home. 2. We address the mess they’ve left behind. The insulation and the mouse bacteria embedded in it comes out, making your home safe from potentially dangerous disease. We employ “bacterial treatments” when the infestation has contaminated oft-used areas like a basement or an attic. 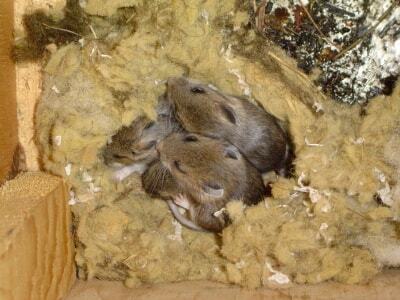 Mice are notorious for using your insulation as their nesting material of choice. This leaves insulation, full of mouse urine, feces and even dead mice, lining your sub-floor. Our clean-up approach mimics the same protocols our sister company, The Mold Pros, uses in mold remediation best practices. Further, we establish containment of the work area and create negative air pressure to exhaust airborne particles outside so as to prevent cross-contamination in the rest of the house. Removing the insulation gives us the perfect opportunity to search for and eliminate rodent entry points, which is the final step in attacking mouse infestations. We take the extra step in mouse control, and put your home back to pre-infestation quality. You won’t find such a thorough approach to mouse infestation in Cape Cod anywhere else. As a locally owned and operated company, we know we can’t afford to miss anything when ridding your home of rats and mice and the bacteria they leave behind, because your health is at stake. If you don’t see your town on our list, call us up at 508-888-0999. If you’re anywhere near Cape Cod, we can probably accommodate you. If you’re not sure the extent of your mouse problem or if you need to remove insulation, don’t worry, we can figure it out for you. Contact us for a free inspection, and we’ll tell you the extent of your mouse, rat or other vermin problem and provide you with a free estimate of what removal should cost. Then you can decide how you want to proceed. Remember, a mouse infestation in Cape Cod left untreated will only get worse, meaning more mouse noises at night, more damage to your home and more disease lingering in your household. The sooner you can resolve your mouse problem the better. Since Pest Pros is so convenient and affordable, there’s really no reason to wait. Again, our inspections are FREE. If you hear the patter of little feet in your attic, or find their little droppings in your basement, give us a call now.